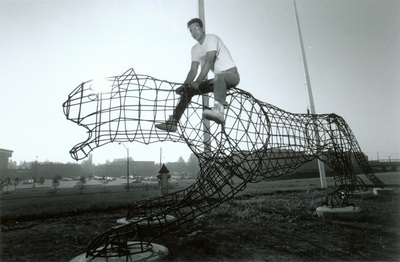 "Panther with artist Rob Lorenson September 1990"
An image of a wire sculpture of panther on the campus of the University of Northern Iowa in Cedar Falls, Iowa. The sculpture by UNI sculpture student Rob Lorenson was installed near the UNI-Dome in 1990. "Panther with artist Rob Lorenson September 1990" (2019). Art on Campus Photographs. 4.